The Crested Butte Titan boys high school hockey season came to an end on Friday, February 24, losing to Valor Christian 4-2 in the second round of the state tournament. It was the first year for the local high school hockey team competing in the CHSAA high school league and they finished the regular season fourth in their conference and ranked 12th in the state with a record of 11-5. 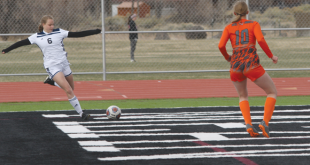 The loss was a tough pill to swallow for the Titans, having opened the tournament with a dominating 8-2 win over Liberty in the first round just two days prior. The Titans came out playing at a level and pace that overwhelmed Liberty, building a 5-0 lead in the first period. An early penalty put Liberty on the power play in the opening minutes of the game but Crested Butte stung Liberty during the penalty kill as Lucas Solanik scooped up a loose puck and skated straight to net for a short-handed goal. The Titans struck again three minutes later as Sam Stepanek took a pass from Michael Hensley up the boards and turned inside to the goal to slip the puck near post for a 2-0 Crested Butte lead. A minute later a shot from Graham Barrett popped up in the air and over the shoulder of the Liberty goalie and after a four-minute break in the scoring, Jordi Nichols slipped through the Liberty defense to score for a 4-0 Titans lead. Patrick Seifert closed out the explosive opening period scoring in the 11th minute for a 5-0 lead and with all three lines providing goals, it was apparent the Titans were on pace to a huge win. 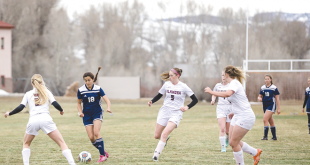 Liberty managed to score the next two goals but Crested Butte finished the game scoring three goals in the final five minutes of the game as Barrett, Hensley and Josh Wallin all found the back of the net for the 8-2 win. “There was a lull in the second period but when they got closer we just picked it up and pulled away,” says Seifert. The win sent Crested Butte to the next round to face Valor Christian in Ft. Collins. Valor entered the tournament the fifth seed and were handed their second loss of the season just two weeks ago by the Titans. The Titans suffered an early penalty three minutes into the game and Valor Christian took advantage of it, scoring on the power play. Valor Christian tacked on a second goal in the 14th minute and the Titans were down 2-0 heading into the second period. The Titans battled back in the second period. Valor Christian was handed a penalty two minutes into the second period and the Titans took advantage of the situation as Nichols scored off an assist from Solanik. Five minutes later Colten Crittendon scored and the two teams were notched in a 2-2 tie heading into the third period. “We dominated a lot of the second period and were playing in front of our bench so we were able to get fresh legs on the ice and just kept pounding them,” says Seifert. The two teams traded off attacks in the third period as tension rose on the ice with Titans goalie Cam Curtiss making a couple of key saves to keep the game tight. Each team tallied four shots heading into the final two minutes when a Titans penalty put Valor Christian on the power play with just under three minutes left in regulation. Valor Christian scored a minute into the power play to take a 3-2 lead but once back at full strength and the goalie pulled, the Titans started to take back the tone of the game. The Titans appeared to tie the game with a minute left but the goal was waved off and as frustration mounted, the Titans racked up two more penalties and were left to finish the game in a 5v3 situation. Valor Christian netted the insurance goal during the final power play to hand the Titans a 4-2 loss and end their season. As a testament to the Titans’ effort in the game and all season, Valor Christian coach George Gwozdecky, who was an assistant coach for the Tampa Bay Lightning and head coach for 19 years for the University of Denver including two NCAA titles, stepped into the Titans locker room after the game.